The recent award handed down by the Arbitral Tribunal through the Permanent Court of Arbitration undoubtedly favours the Philippines  (PDF) and is unlikely to end Beijing’s assertive behaviour in the South China Sea. Beijing has wasted no time in rejecting the ruling, claiming it to be ‘null and void ’, but the superpower isn’t likely to go running away with its tail between its legs. In fact, China has vowed to  ‘take all necessary measures to protect its sovereignty in the South China Sea’, including potentially establishing an ADIZ across the region . But how other claimant and non-claimant states act in response to the Tribunal’s ruling will set an important precedent for dealing with behaviour that challenges the rules-based global order. Despite the Tribunal concluding that  ‘there was no legal basis for China to claim historic rights to resources within the sea areas falling within the “nine-dash line”’, China’s fishermen militia will continue to fish in areas where China believes it has overlapping maritime claims. Such challenges will be hard to counter, since Southeast Asian claimants have only limited capability to enforce their sovereignty, and a fluctuating willingness to confront China. Ideally, Southeast Asian nations would present a united front that’s both aligned with international law and remains cognizant of where the red lines lay. That course poses a particular challenge for Philippines president Rodrigo Duterte, who faces the dilemma  of continuing with his plan to ‘reset’ the Philippines’ relationship with China or coming down hard on the Philippines’ largest two-way trade partner . Actually, China might decide that its best prospect for blurring the Tribunal’s decision lies in its achieving a bilateral deal with Manila that recognises some of China’s claims in exchange for concessions elsewhere. So Duterte’s course of action could be formative. How the Philippines acts in response to the Tribunal’s award could also set a precedent for both claimants’ and non-claimants’ responses to future disagreements with China. And with China flying nuclear-capable H-6K bombers and fighter jets  near the contested Scarborough Shoal last week, Beijing’s signaling there’s still much to play for. Indonesia, which also gained from the Tribunal award, is a case in point. Its formal position— that it has no border dispute with China—has now been given legal reinforcement by the Tribunal’s ruling. But that won’t stop Chinese fishermen from encroaching on Indonesia’s EEZ, nor will it prevent Chinese naval vessels from offering them protection. If Duterte doesn’t firmly enforce the sovereignty of the waters surrounding his country, it could not only indicate that claimant states will bend to Chinese pressure, but also serve to discourage Jokowi from continuing with his more assertive stance on Chinese incursions on Indonesian waters. Indonesia recently ramped up its efforts against China’s behaviour in its waters, in particular slamming a recent statement from China’s foreign ministry  espousing ‘overlapping claims for maritime rights and interests’ in the waters off the Natuna Islands. After the third confrontation between Indonesia and China this year in Natuna waters, President Joko Widodo signalled  to Beijing that his country wouldn’t be cowed. He visited the Natunas and hosted a limited Cabinet meeting aboard the Indonesian Navy vessel that fired warning shots at Chinese trawlers the week before. And following the ruling, Indonesian Defense Minister Ryamizard Ryacudu detailed plans  to deploy warships, fighter jets, SAMs, and drones—as well as construct port facilities—around the Natunas. Now, as the de facto head of ASEAN, Indonesia’s challenge will be to encourage a regional response that sets a precedent on how to address future Chinese territorial incursions. In its formal statement on the Tribunal’s ruling , Indonesia’s Ministry of Foreign Affairs reiterated the importance of refraining from any escalatory actions in its near region, as well as resuming peaceful talks with a basis in international law on any existing overlapping claims. The Ministry also emphasised the important role that a zone of peace and neutrality would play in strengthening ASEAN’s political and security communities. Indonesia has requested states to respect international law, with the statement spurring criticism  from Chinese experts for being less ‘objective, just and fair’ than its traditional non-claimant stance on the South China Sea. Cultivating that uniform response across ASEAN states—or even across claimants—is no simple task. Some expected  the award to help ASEAN achieve a consensus position, but the evidence so far has been weak. The 49th ASEAN Foreign Ministers’ and Post Ministerial Conference meetings in Vientiane this week provide another opportunity for China to ‘divide’  and ‘coerce’  member states. A united ASEAN could produce and finalise an ASEAN–China Code of Conduct for Parties in the South China Sea that would soothe tensions after the arbitration and establish precedents for the future of the region’s maritime security. But the challenges of coordinating such a diverse grouping of states, all with differing levels of economic dependence on China, has been demonstrated in last month’s spectacular failure  by ASEAN to stick to a firm position on China’s aggressive island-building. And with a traditionally non-aligned foreign policy and a now legitimised stance as a non-claimant on the issue, there’s little reason for Indonesia to seize ASEAN’s reins over a unified position. If states in the region move towards no longer seeing ASEAN and its regional architecture  ‘as the vehicle through which to resolve territorial disputes’, Indonesia might seek to engage its neighbours in new forms of defence diplomacy to build confidence and concord. Those could take the form of finalising the terms of the proposed Indonesia–Malaysia–Philippines joint patrol  of the Sulu and Celebes seas. 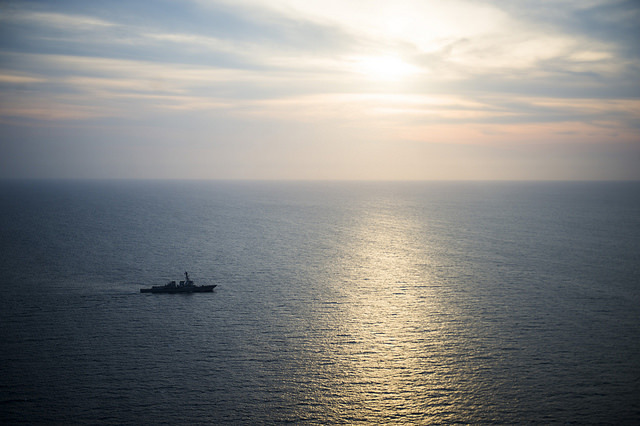 Whatever the outcome, the coming months might well prove pivotal in shaping the future of the South China Sea. Both claimant and non-claimant ASEAN policymakers should use the confidence gained from the ruling to assert their sovereignty and commitment to the rules-based order. Inaction could prove a dangerous precedent as China attempts to save face and seize the initiative once more. Amelia Long is a researcher at ASPI and an editor of The Strategist.